A year ago, with a late flourish, Cork dethroned Kilkenny and attained historic eminence in senior camogie. A 27th title moved them one clear of Dublin, who have been chained to 26 since 1984. On a wet day, with scoring a modest 0-10 to 0-9, the finish produced a gripping spectacle. Off the bench only a short time, Julia White hit the winning point with the clock showing 66 minutes, 16 seconds. On the hour mark, Gemma O'Connor delivered a dramatic equaliser from 65 metres which added to the day's lore given that she wasn't supposed to play due to a knee injury. Denials of her availability by the Cork manager, Paudie Murray, in a television interview beforehand, could only act as camouflage for so long. When the game started she was in the Cork half-back line and would end the year with a record tenth All Star. It marked a personal triumph for the former Cork captain, White, who had endured two tough years sidelined by injury after tearing her Achilles tendon and then breaking her foot. Kilkenny, fancied after winning for the first time since 1994 the previous year and winners over Cork in the National League final in April, were slow out of the traps, scoring only two points in the first half. The year before it was Cork they had defeated in the final, and nobody is surprised it is Cork they meet again today. Their paths crossed in this year's League final too, where Kilkenny began with a supersonic surge at Nowlan Park. At one stage they led 0-8 to 0-0 in a blistering opening. That score went to 0-11 to 0-1 before Cork made a comeback and nearly reeled them in, Kilkenny finishing with an extra player and surviving a penalty which Cork failed to convert. This year's senior championship has seen a first All-Ireland quarter-final appearance for Waterford and a first semi-final for Tipperary in 10 years. Meath have also joined the senior ranks, and brought some novelty, after winning the intermediate title in 2017. But the two senior finalists are easily the most dominant forces in the game, and this is their fourth final meeting in five seasons. Cork were also in last year's intermediate final and won the minor A championship in April. They contest today's intermediate final, against Down, too. Having stalled Cork's three in a row plans in 2016, Kilkenny are now determined to regain the title they lost last year. Niamh McGrath, an All-Ireland senior medal winner in 2013, has a slight fancy for Ann Downey's team. 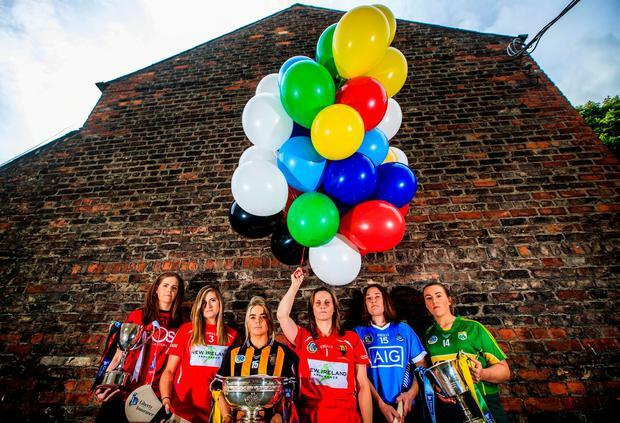 "I think Kilkenny will win because they have had tougher tests compared to Cork. Cork haven't had a tough test. Kilkenny will be more weathered from playing us twice (group stages and semi-final) and their group match against Waterford was also competitive. I think they have more dangerous forwards than Cork. It'll be tight though. Cork are very good at their running game, it is very hard to stop, and they've such a spread of scorers this year as well. "I think Kilkenny aren't playing as defensively this year, but playing more of a running game, and they realised last year that it did not work in their favour. They've changed their approach this year." They are the two stand-out teams in the last number of years. There is also the closeness of the meetings. In the most recent League final and last year's All-Ireland final, only a point separated the teams at the final whistle. "And I think it is going to be pretty much the same this weekend," says the former Wexford All-Ireland winner Ursula Jacob, a winning captain in 2011. "I think it will be a low enough scoring game because both defences are quite tight and because they play so similar to each other." With both half-forward lines deeply set to allow space in front of their inside lines, it promises congestion around the middle third. Jacob has been impressed by the Cork scoring spread, with eight different scorers in the semi-final against Tipperary. They included the player of the match, Chloe Sigerson, who notched three points from wing back. They coasted home by 12 points. In the semi-final against Galway, Kilkenny took time to exert their dominance and had a much more competitive contest. Their performance was notably slow to get going and featured a strong finish. Still, Kilkenny's defensive stubbornness and physical prowess is seen in the fact that the team has only conceded one goal in the Championship, in injury time in that victory over Galway. The needle that was evident leading into last year's final doesn't appear to be as noticeable now. It originated in a pushing incident during the pre-match handshake in 2016 and perceived disrespect shown by Cork to Kilkenny when warming down during the presentation of the league trophy to Kilkenny last year. Cork denied the latter charge but relations were undoubtedly strained. In the meantime, the two groups have shared a trip to Madrid together on the inaugural All Stars tour. Since Ursula Jacob retired in 2015, television coverage of camogie has expanded and the efforts being made by other counties to progress is underlined by the employment of well known coaches from hurling, with David Herity involved with Dublin as a coach and Richie Power with Offaly. "Now they are showing all knock-out games on television," says Jacob. "When I was playing it was just the final. From that point of view it is getting out to a wider audience. More and more people are being exposed to it. I would still like to see the incorporation of camogie games before the men's senior games, I feel that is the way you will get more neutrals there."